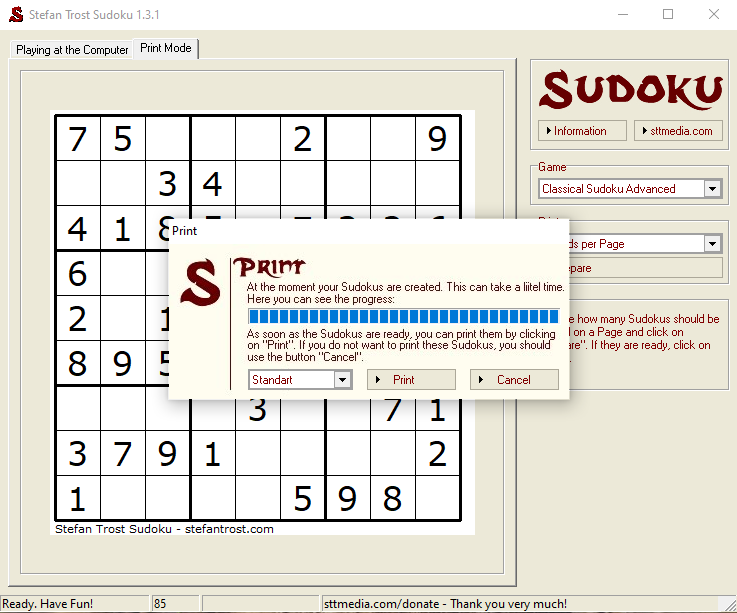 Play Sudoku on your computer or print out the game sheets to play the old fashion way. Sudoku is the short form for the Japanese sentence "Suji wa dokushin ni kagiru", what can be translated as "all numbers have to happen exactly once". It is a logic puzzle which resembles the magical squares. The first known Sudoku-like game was developed by the Swiss mathematician Leonhard Euler under the name "Latin Square" in the 18th century. After that there were further variants again and again, but very popular it became in Japan within the 1980s. Meanwhile it enjoys worldwide popularity. 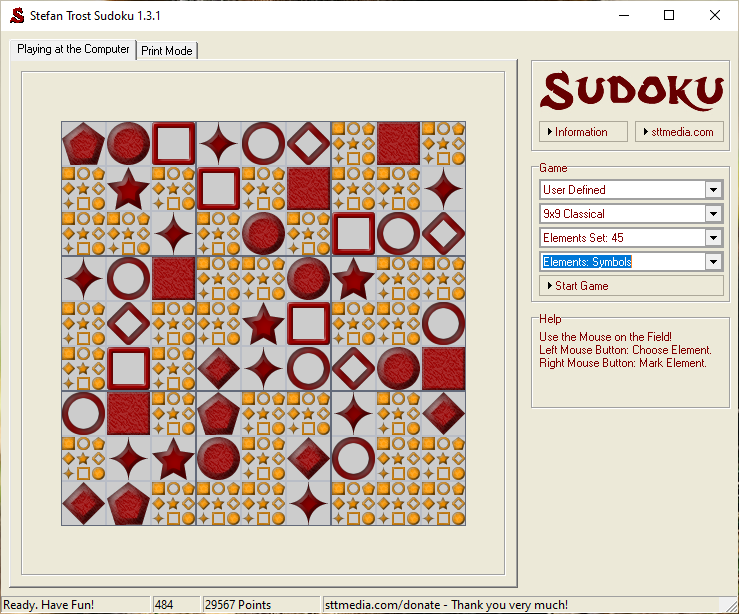 You can play Sudoku on the computer with our program or print out the playing fields, depending on how you prefer to play. In the print mode you can first specify under "Game", which size your playing field should have. After that you can choose how many games should be printed on a single page. By clicking "Prepare", the corresponding games are created. 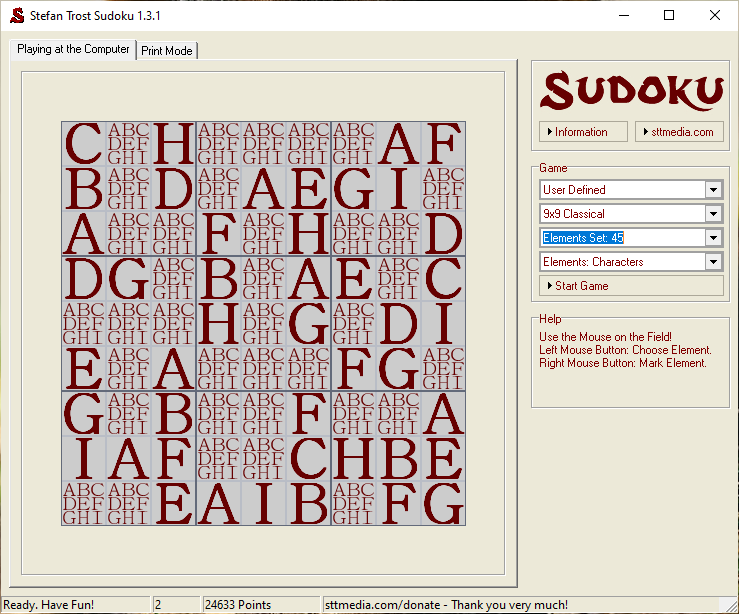 If you are satisfied with the generated games, just click "Print" to print the sudoku boxes. Of course you can also generate other new ones if you would like to do this. 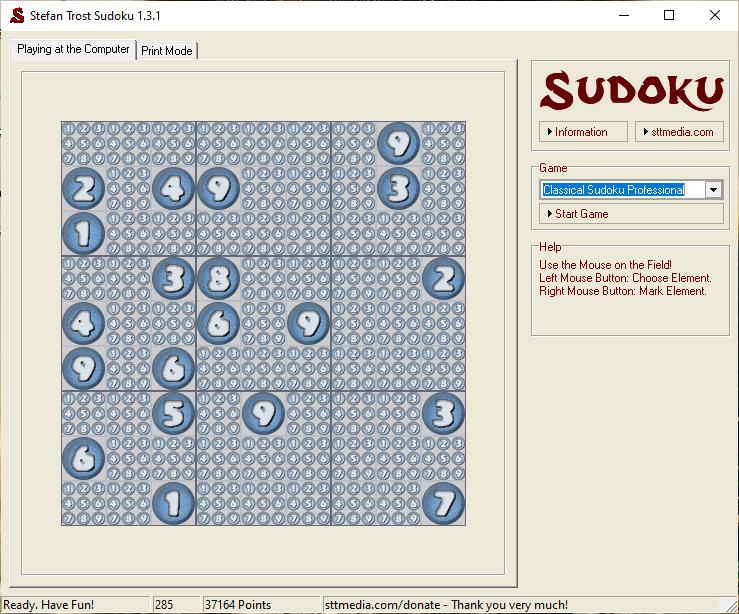 At the computer there are some further possibilities to play Sudoku. One of them is the game with letters. For this you can choose the option "User-Defined" under "Game". Here you have some other options for specification. For example, you can adjust freely, how many elements should already be solved, how big the size of your field is and what kind of elements you would like to use. For example letters. Then you can start your game with the button "Start Game". In addition, in the box at the bottom right, there are displayed information about which actions are currently possible. Besides the game with letters you can for example also play Sudoku with symbols. This screenshot shows the game situation of a field with symbols, which has the size of 7 x 7 and 23 entered elements. In the status bar below you are always informed about your current score. The longer you need for a game, the more points are removed. Of course, it is also possible to play at the computer with numbers. In the next screenshot, the option for beginners is selected. This option can be used for example if you would like to practise a bit or you do not have enough time for a long game. By the way, the rules for the small fields are, that every number have to occur only one time in every line. 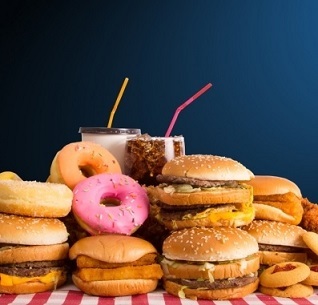 53 214 Stefan Trost Media <img src="https://www.oldergeeks.com/downloads/gallery/thumbs/sudoku1_th.png"border="0"> Mar 29, 2019 - 12:01 1.0 905.3KB ZIP , out of 1 Votes.